I was using the frontend and ios criterias before (javascipt, html/css, node.js, swift, obj-c and so on). Recently I've tried to search for jobs in completely different field – game developemnt and Unreal Engine. But after changing the criterias and even when I'm explicitly search for "Unreal Engine" I still get only frontend or ios jobs. The same for the alert emails – they are still about frontend positions. I can't see any job alerts associated with the account you posted with. Is it possible you have more than one account? What email address were the job alerts sent to; you can send it to me at dward@stackoverflow.com and I'll take a look. Not the answer you're looking for? 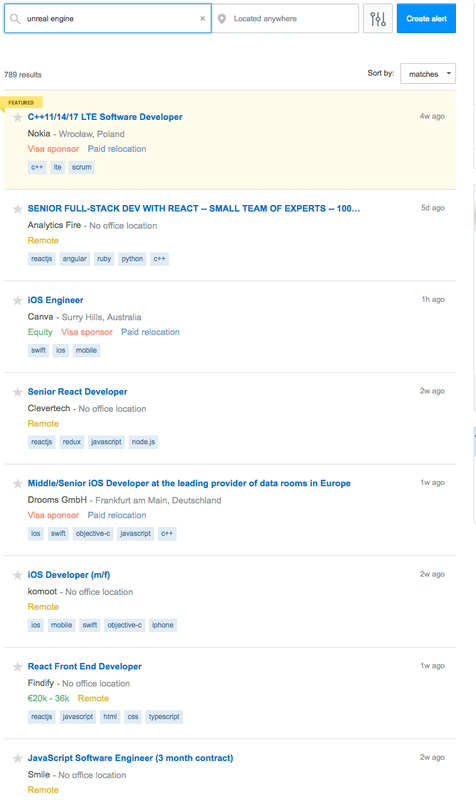 Browse other questions tagged bug jobs job-alerts job-recommendations . Want an Android job only shows one job forever. Is this the perfect job for me :P?